Because of this former ubiquity, cod liver oil has it's own special place in urban legend. Your grandparents might even recount horror stories about having been forced to take it straight up from a spoon as a child. So the actual flavor of cod liver - and the cod liver oil it's packed in - is likely to come as a huge surprise. Far from being overwhelmingly "fishy" or rancid-tasting, the flavor is relatively mild and delicate - certainly no worse than a good canned salmon and much less fishy than a can of sardines. 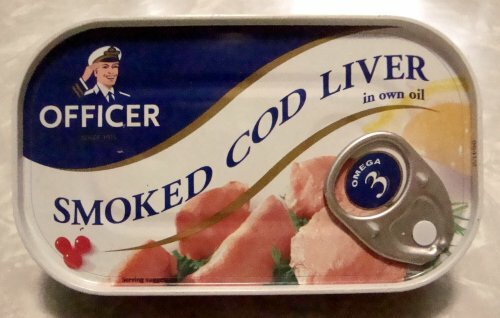 Officer Smoked Cod Liver is a product of Denmark, packed in a 4.26-ounce can. Inside the can there is a generous portion of cod liver in very pale amber oil. The pieces of liver inside are soft but firm, creamy and smooth and buttery. The liver is meltingly tender - almost ethereal in texture - with a gentle, pleasant fish flavor. More than anything, it reminded me of caviar-flavored butter. I enjoyed the liver spread on thinly sliced and toasted pumpernickel bread for breakfast, closely attended by my fish-loving dog Zim. I gave him a tiny bit of the liver, thereby ensuring his continuing devotion, but I have to be careful about feeding him anything this fatty - the last time I tried cod liver in its own oil, I gave a somewhat larger piece to the dog and it kind of seeped out unexpectedly if you know what I mean, and I think you do because let's face it, we're all adults here. Combine the cod liver, shallot, and eggs in a bowl and thoroughly blend with a fork. If the mixture seems too dry, drizzle in some of the reserved oil in as you mix until the salad is the consistency you desire. This is very good as a filling for small tomatoes, or simply spread on bread or crackers. 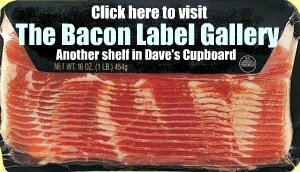 I used to work at a Jewish deli, and there were always cod liver tins like that on the canned products shelves. 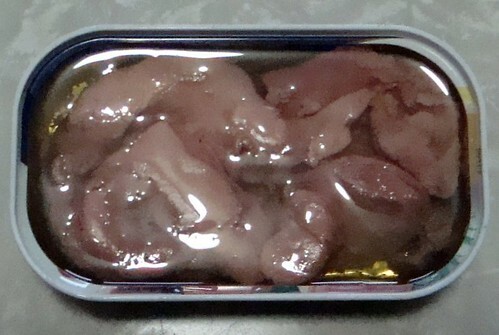 I like cod liver, but I like liver-it has never bothered me. I'm a little weary of liver from animals off of conventional farms nowadays though. That being said, cod liver sounds better than ever! Maybe I'll stop by Fatima's market on the way to Target and pick up a 'Fishy Delight'. This is a great recipe. I found some canned cod liver in a local Russian store and it was really great! I've been looking for a way to eat cod liver (oil) as food rather than just forcing it down with an OJ chaser. I follow the nutritional recommendations of Weston A. Price Foundation and they prescribe a daily dose as a Vitamin A supplement. I'd like to link this recipe to my blog Sustainable Sachi, if you don't mind. Cod liver..., my favorite! Very rich in minerals and vitamins. I love it in salads, sandwiches, mixed to white rice..., and best ON THE SPOON!!! The only thing is that I have to consume it in small amounts because it might upset my stomach.